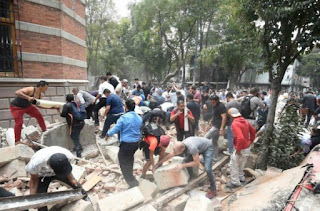 News reaching us in the early hours of today is that Mexico got hit with a double catastrophe on Tuesday as it did not just have a fresh earthquake to contend with, but also an eruption of Popocatepetl volcano. In Atzitzihuacan on the slopes of the volcano, a church collapsed during mass, killing 15 people, Puebla Governor Jose Antonio Gali said. This is in addition to the 149 people who died when a powerful earthquake of magnitude 7.1 struck central Mexico, toppling buildings in the heavily populated capital where rescuers scoured frantically under the rubble of ruins for survivors. Thousands ran into the streets in panic, and millions lost electricity when the quake struck around lunchtime. Mexico City Mayor Miguel Angel Mancera said 44 buildings were severely damaged or destroyed. Several major gas leaks and fires occurred. The temblor occurred on the 32nd anniversary of a devastating quake that killed thousands in Mexico City in 1985. Many Mexicans had taken part in earthquake drills on Tuesday as is customary every Sept. 19. A powerful quake in southern Mexico on Sept. 7 killed at least 98 people. Among buildings that collapsed in the capital on Tuesday were apartment blocks, a school, a factory and a supermarket. The fashionable Roma district was hard hit, and a six-story apartment building was among several collapses reported.